Selangor State Government has announced that the first 20 m3 water will be provided free of charge to household users since 1st June 2008. In fact, Syabas managed to reduce NRW from 42 percent in 2005 to 37 percent in 2006. Syabas profit also increased from RM 900 million in 2005 to RM 1.1 billion in 2006. We believe that the biggest contribution that Syabas can provide to its users is to further reduce NRW to below 20 percent in five years. Former Selangor Exco in charge of Public Facilities and Infrastructure Abdul Fatah had on 30th October 2006 increased water tariff and during that increase, it was also announced that 42 percent of household users who consumed less than 20 m3 a month will not be affected. Today, the percentage has increased to 45 percent and it seems that the strategy has always been targeted on household users who consumed less than 20 m3 a month. We need to understand that such measure is only a short term measure. Syabas should be reminded that their long term goal is to provide sustainable water supply to all users in Kuala Lumpur and Selangor. One major project under Syabas to be deliberated is the Pahang-Selangor water supply project which was iniated by the previous Selangor State Government. The current Selangor State Government has a huge responsibility to ensure that the project will not pose serious negative impact on the people of Selangor. The same reminder should also go to household users in Selangor that they should not take things for granted even when the first 20 m3 water will be provided free of charge as this should be seen as a push factor for them to preserve water usage to below 20 m3 every month so that they can enjoy free water supply. Release Manoharan and others from ISA detention to attend swearing-in ceremony for Selangor ADUNs. According to formal notice from Selangor State Legislative Assembly (DUN) Secretariat, the swearing-in ceremony for all 56 elected State Legislative Assemblypersons will be conducted on Tuesday 8th April 2008. Therefore, we urge the Federal Government to release YB M. Manoharan, DAP ADUN for Kota Alam Shah before the swearing-in ceremony so that Manoharan can attend the ceremony and thus making the swearing-in ceremony a complete ceremony. The continued detention of M. Manoharan under Internal Security Act (ISA) is no longer accepted by the people as voters in Kota Alam Shah had delivered a clear message to the Federal Government that they want Manoharan to represent them in the State Legislative Assembly with a majority of 7184 votes for Manoharan. The Federal Government should release Manoharan so that he can effectively discharge his duties and responsibilities as an elected representative for Kota Alam Shah. Continued detention on Manoharan would mean that the Federal Government has no will to allow elected representative to discharge their duties and responsibilities and this is not a responsible government should do. In fact, the Federal Government should not only release Manoharan but also the other four Hindraf ISA detainees, i.e. P. Uthayakumar, G. Kanabatirau, K. Kenghadharan and T. Vasanthakumar. Their intention of being leaders of Hindraf is merely to voice out for the long marginalized Indian community in Malaysia and should not be regarded as threatening the security of the nation. Forum on Interventionist Monarchs - A Complement or a Challenge to Democracy? The Civil Rights Committee of the Kuala Lumpur and Selangor Chinese Assembly Hall (CRC-KLSCAH) and Suara Rakyat Malaysia (SUARAM) will be holding a forum discussion on the role of constitutional monarch in a democratizing Malaysia. Constitutional monarchs are seen by some quarters as the guardian of democracy against the wrongdoing of elected politicians. Free from electoral pressure, the sovereign may act in the real interest of the nation better than politicians. From this perspective, many see their Royal Highnesses the Sultan and Crown Prince of Perak as the model national leaders for their stances on judiciary independence and an inclusive nationhood. The March 8 elections ushered in new political reality which changes the operational setting for "interventionist monarchs". Alongside the Opposition parties, the palaces have been empowered. This does not only happen in Perak and Selangor where new parties have come into power with slim majority in the legislature, but also in Perlis and Terengganu where the incumbent BN secured two-thirds of the legislature. In the standoff in Terengganu, the palace and the legislative majority have had completely opposite preferences. Is such royal intervention in government formation constitutional according to the letters of the law? Beyond legality, is it in line with the norm of constitutional monarchies where the monarchs are only the figurehead? Can the palace, an unelected institution, dictate who should head the government and who sit in the cabinet? In the context of democratization, is the ascendance of royal power at the expense of the declining hegemonic party desirable? For the details, please contact with assistant secretary of CRC, Mr.Chan,03-22746645. PETALING JAYA 27 Mac – Ahli-ahli Parlimen dan Dewan Undangan Negeri kawasan Petaling Jaya berjanji akan melaksanakan tugas dengan telus dan bekerjasama rapat dengan Majlis Bandaraya Petaling Jaya (MBPJ). Ahli Dewan Undangan Negeri (ADUN) Taman Medan, Haniza Mohamed Talha berkata, kerjasama tersebut akan dilaksanakan melalui perkongsian maklumat serta mencari jalan penyelesaian secara bersama dalam mengatasi sebarang masalah. Menurutnya, semua wakil rakyat akan mengambil langkah proaktif dalam mencari jalan penyelesaian kepada setiap aduan dan masalah yang dihadapi oleh penduduk. “Kami juga meminta pihak MBPJ memaklumkan kepada penduduk setiap tindakan yang mereka lakukan supaya mereka tahu aduan mereka didengar dan sedang dalam proses penyelesaian,’’ katanya. Beliau berkata demikian pada sidang akhbar selepas pertemuan tertutup sembilan wakil rakyat kawasan Petaling Jaya dan Datuk Bandar Petaling Jaya, Datuk Mohamad Roslan Sakiman di sini semalam. Ahli Parlimen yang hadir ialah Ahli Parlimen Petaling Jaya Selatan, Hee Loy Sian, Pua Kiam Wee (Petaling Jaya Utara) dan R. Sivarasa (Subang). ADUN pula ialah Lee Poh Lin (Bukit Gasing), Lau Weng San (Kampung Tunku), Elizabeth Wong Keat Ping (Bukit Lanjan), Cheah Wing Yin (Damansara Utama) dan Dr. Mohd Nasir Hashim (Kota Damansara). Sementara itu, Haniza berkata, wakil rakyat kawasan itu juga akan memastikan semua permohonan kontrak dan tender yang dihantar kepada MBPJ diproses mengikut prosedur yang telah ditetapkan. “Pemohon akan dimaklumkan mengenai prosedur itu, selain proses yang berlaku seperti perubahan, pembatalan dan penerimaan tender kerana mereka berhak untuk tahu,’’ jelasnya. Sementara itu, Mohamad Roslan menganggap pertemuan tersebut sebagai suatu usaha yang baik antara pihak berkuasa tempatan (PBT) dan wakil rakyat demi kesejahteraan penduduk Petaling Jaya. “Malalui pertemuan ini, kita akan dapat berbincang tentang pelbagai isu dan polisi yang bakal dilaksanakan bersama kerajaan baru,’’ katanya. Menurutnya, dasar dan polisi yang dibincangkan dalam pertemuan itu belum diputuskan sepenuhnya kerana pihaknya masih menunggu pelantikan Ahli Majlis pada penghujung April depan. Ditanya mengenai pelantikan Ahli Majlis baru MBPJ, beliau memberitahu, ia akan dilakukan melalui proses pilihan raya oleh penduduk mengikut zon yang telah ditentukan. “Proses tersebut dijalankan bagi memberi peluang kepada wakil komuniti, pegawai kerajaan, pertubuhan bukan kerajaan (NGO) dan badan profesional untuk mengisi jawatan itu,’’ ujarnya. PORT KLANG: Selangor Mentri Besar Tan Sri Khalid Ibrahim is hoping to meet Transport Minister Datuk Ong Tee Keat and top officials from the Port Klang Free Zone (PKFZ) next week to discuss how the state government can help to increase business in the area. Khalid said he had been informed that the Transport Minister and PKFZ senior officials would be “available for coffee next week” to discuss the future of the 400ha Free Zone with him and how the state government could help add value to the business activities there. He said the state government was interested in seeing better utilisation of the facility as it would help improve the state’s economy further by providing more jobs and business for its people. He said he was happy to learn that efforts were underway to get PKFZ moving through cooperation from state bodies, the Malaysian Industrial Development Authority (Mida) and other government agencies. “Selangor is willing to play its part if the Federal Government wants to corporatise PKFZ and I have experience in the matter since I was involved in the corporatisation of Port Klang while I was with Kontainer Nasional,” he told reporters after a surprise visit to PKFZ Thursday afternoon. He said an organisation owned by the Dubai Port and other ports of the world had indicated interest in running the zone if it could be packaged into an appropriate business deal and such a deal would fit the Federal Government’s initial plans to have a body run it independently. On whether the state government was interested to take over the project as one of its subsidiaries, Khalid said, the state was now taking a “wait and see” approach to any such suggestion and primary concern now was ensuring PKFZ’s full utilisation. KUALA LUMPUR: The Selangor state government should check if it has any jurisdiction over the Port Klang Free Zone (PKFZ) before suggesting that it wants to take over the project, Transport Minister Datuk Ong Tee Keat said. "The respective parties must understand the nature of this project and identify the scope of jurisdiction of the state government, if any, over this project." Ong was responding to Selangor Mentri Besar Tan Sri Abdul Khalid Ibrahim's statement about allowing the state government to take over the project in order to revive it. "Anybody can suggest anything, what is important is if there is such a proposal, do submit it to the ministry concerned," he said Thursday after witnessing a signing ceremony between AirAsia-X and Airbus for the purchase of 10 new A330-300s. As for a review of the project, Ong said his ministry was currently in the process of doing so. Ong, said he had much more to say about various issues related to his ministry but would save it for media interviews he would be conducting in the next few days. Emergency works to rehabilitate failed slope at Taman Seaport reservoir SS3 – to solve the problem or to create more problems? I received a complaint from a group of residents from Jalan SS3/49 and Jalan SS3/51, Taman Seaport last week that a group of contract workers were clearing a piece of open space located at their backyard, in which Syarikat Bekalan Air Selangor Sdn. Bhd. (Syabas) claimed to own this piece of land. I was informed that the project, which is named “Emergency Works to Rehabilitate Failed Slope at Taman Seaport Reservoir SS3, Petaling Jaya, Selangor, Contract No. : Sya/PMD/08/con 003” was started in late January 2008 without any consultation with the residents. Some complaints were brought to the then elected representative and work was temporarily stopped. Conversation with the workers indicates that the “rehabilitation” work will involve clearance of the whole open space. Residents objected strongly to the project as it was approved without any consultation although the project is conducted on a piece of land owned by Syabas. This is a direct violation of the principle of Local Agenda 21 which aims provide a chance to the communities that the local authorities serve to work together to plan and care for their surroundings towards sustainable development. Secondly, residents also doubt if the project is approved by Petaling Jaya City Hall (MBPJ). Syabas, in one of its latest notice to the residents, claimed that they have had it but it was not properly substantiated. Instead of solving environmental problem, residents believe that it will bring more environmental problem when the project involves massive clearing of a piece of stable open space, especially if there were any Environmental Impact Assessment (EIA) report been done, judging from the scale of the project. A complaint was made to the General Manager of Syabas in Petaling Jaya on 24th March 2008. He replied that a stop work order has been issued pending on the decision from local council and meanwhile he will direct my concern and the residents’ complaint to the higher authority in Kuala Lumpur headquarter as the project was awarded by Syabas headquarter in Kuala Lumpur. However, work resumed on 26th March 2008 when Syabas claimed that MBPJ has approved the project. Residents were shocked to notice this as they are again kept in the dark for any consultation. I will report this to MBPJ to check the validity of their approval and if it has been approved, MBPJ owed the residents an explanation why they were not involved in any consultation. Similar complaint will be lodged to the Department of Environment to examine the project if there is any violation of any provision under various environmental protection acts. Apabila Kit Siang mengeluarkan kenyataan bahawa Ahli-ahli Dewan Undangan Negeri (ADUN) Perak akan menarik diri daripada menghadiri upacara mengangkat sumpah Menteri Besar Perak yang baru pada 12hb Mac 2008, beliau dan DAP dikritik hebat oleh UMNO and kuncu-kuncunya kononnya DAP tidak menghormati Tuanku Sultan Perak. Mereka terus cuba memperbesarkan isu ini sebesar yang mungkin untuk mengapi-apikan sentimen perkauman melalui laporan media serta demonstrasi-demonstrasi kecil-kecilan, biarpun Kit Siang telah pada hari keesokannya mengeluarkan satu lagi kenyataan untuk memohon maaf secara rasmi kepada Tuanku Sultan Perak berserta dengan perjumpaan beliau dengan Tuanku Raja Nazrin selepas upacara angkat sumpah Menteri Besar Baru Perak. Kini, giliran mereka sendiri pula yang menunjukkan sikap tidak menghormati baginda Sultan Terengganu. Malahan UMNO begitu berani sehingga mereka betul-betul memulaukan majlis angkat sumpah dan menghantar nota bantahan kepada Istana Terengganu. Sebelum mereka menuding jari kepada orang lain, ingatlah kelakuan diri sendiri pula. Jangan pula cakap tak serupa bikin. Much have been said about the final line up in Selangor Exco. It was reported that DAP is suggesting four exco seats, PKR four and PAS, being the minority, two. According to a New Straits Times report today, this formula is unworkable because PKR intends to allocate two exco positions to non-Muslims. Should DAP have four exco members, the exco would end up with a non-Muslim majority - a scenario which is not favoured by the Selangor palace, reported the daily. Malaysiakini reported that PKR is expected to nominate Lee Kim Sin (Kajang), Dr Xavier Jayakumar (Seri Andalas), Nik Nazmi Nik Ahmad (Seri Setia) Yaakob Sapari (Kota Anggerik) and Haniza Mohd Talha (Taman Medan) for the five posts. It was further reported that the four DAP names submitted for exco posts includes Ean Yong, Liu, Teresa Kok (Kinrara) and Teng Chang Khim (Sungai Pinang). While we respect the concern of HRH Sultan of Selangor, this dilemma could be solved if each party can drop one exco seat to become PKR 3, DAP 3 and PAS 1 from the original 4-4-2 formation. With that, we will have 5 Malay excos (including MB himself) with 3 non-Malay excos. Fair to all. If this is not workable, then we proceed with 5-3-2 for two years and revert to 4-4-2 for the remaining two/three years. After all, the line up should be reshuffled after a certain time period, just like we have cabinet reshuffle after one or two years Cabinet members in office. Selangor Exco to swear in on Monday! 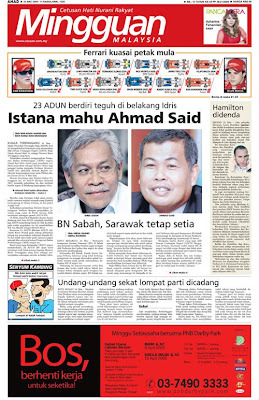 Finally, the Selangor State Government Exco will be sworn in on Monday, 24th March 2008. Saya di sini menyeru Kerajaan Pusat untuk membebaskan Sdr. YB M. Manoharan, ADUN DAP untuk kawasan Kota Alam Shah, Klang. Sdr M. Manoharan merupakan salah seorang aktivis Hindraf yang masih ditahan di Pusat Tahanan Kamunting di bawah Akta Keselamatan Dalam Negeri (ISA) atas tuduhan mengancam keselamatan negara. Pada pilihanraya umum ke-12 yang baru-baru berlangsung, Sdr M. Manoharan telah bertanding di kawasan DUN Kota Alam Shah, Klang dengan majority sebanyak 7,184 undi biarpun Sdr M. Manoharan masih ditahan di Kamunting di bawah ISA dan tidak dapat muncul untuk berkempen. Kejayaan besar yang dicapai oleh Sdr M. Manoharan ini bukan merupakan satu kejayaan yang besar untuk DAP dan beliau sendiri, malahanya ianya juga merupakan satu mesej yang jelas kepada kerajaan bahawa kerajaan tidak boleh terus menahan mereka yang tidak bersalah tanpa perbicaraan melalui ISA, khususnya dalam kes Sdr M. Manoharan ini. Apa yang dilakukan oleh Sdr M. Manoharan selama ini hanyalah untuk memperjuangkan hak asasi untuk golongan masyarakat India yang tertindas dan terpinggir dan ianya tidak mengancam keselamatan negara. Oleh itu, Sdr M. Manoharan harus dibebaskan serta-merta agar beliau dapat mengangkat sumpah sebagai ADUN kelak dan menjalankan tugasnya dengan sempurna. PETALING JAYA: Kampung Tunku assemblyman Lau Weng San has lodged a police report requesting police to investigate whether certain parties purportedly destroyed important documents belonging to the Selangor state government. "Such incidents were reported in the electronic media. I ask the police to conduct an investigation to ensure important Selangor government documents are not destroyed in order to have a smooth transition of state government powers," Lau said in his report. Lau, who lodged his report at the Sea Park police station here on Thursday, said he was concerned that certain confidential documents kept at the state building in Shah Alam were being destroyed before the new opposition-led Selangor government took over. "There needs to be added security to ensure these documents are safe," he said at a press conference on Friday. PETALING JAYA (March 14, 2008): Kampung Tunku assemblyman Lau Weng San today urged the police to ensure the "safety" of Selangor government documents and investigate whether any such documents have been maliciously destroyed by some state government officers. In a press conference today , Lau said after seeing photos of state government officers allegedly shredding some state documents, which were posted online, he lodged a police report yesterday and requested help from the police as he has not officially been sworn in as an assemblyman and that he has no authorisation to enter the state building in Shah Alam, which has been cordoned off since polling day on March 8. 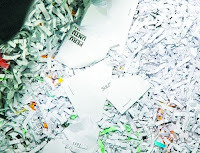 He said according to online news reports, the incident of shredding the state documents took place on March 10 when the new Mentri Besar Tan Sri Khalid Ibrahim was having a closed-door meeting with state secretary Datuk Ramli Mahmud and state treasurer Datuk Mohd Arif Abdul Rahman in the state building. "About six government officers were found shredding the documents that labelled as "private and confidential" on the 12th floor by some photographers who were covering the meeting. "Some of these document could be the meeting minutes of the (former) state exco, which are very important for the new state government to use as reference and I am worried that they are trying to hide or destroy the evidence of something that were unlawful," he told reporters. Lau said he hoped the police will determine whether the action of the officers were legal, and if not, they must face legal consequences. As an "outsider" (I was not part of the electoral this year because I just moved abroad), the results from the 2008 elections will be a wake up call not just for the Government but for the people. My father is right - the people asked for a change, they made the choice by voting and now, we ought to live the choices that we made. ...if we complain about the level of corruption, then we ought to STOP taking bribes. When the demand stops, the supply will as well. ...if we complain about the rubbish on the streets, then we ought to STOP littering. One tissue, one orange peel, it all adds up. ...if we complain about the parking woes, then we ought to STOP taking shortcuts and instead pay that RM0.60 for parking space. ...if we complain about the public transport, then we ought to STOP driving and instead take the public transport. The reason why it's crappy is because 1) no one uses it and 2) therefore it's not making money, thus 3) it cannot improve. ...if we complain about that illegal restaurant, then we ought to STOP patronizing illegal businesses! If we can grow enough brains and balls to deny 2/3 majority to the Government, we sure do more than stop ourselves...WE OUGHT TO STOP OTHERS from making Malaysia a "third-world mentality" state!!!! Man does not live on an island himself. Start leaving notes on people's cars, taking photos and putting them up on blogs. Be more proactive YET be polite! REFLECTING its seriousness in pursuing fair representation of the various communities, the new Selangor exco line-up led by Mentri Besar-designate Tan Sri Abdul Khalid Ibrahim will feature PKR taking five posts, DAP holding four and the remaining two posts going to PAS. In the recent election, PKR, DAP and PAS won a total of 36 state seats in Selangor while Barisan Nasional managed only 20 seats. Khalid, who is PKR secretary-general, won the Ijok state seat with a majority of 1,920 votes. Sources told StarMetro that apart from Khalid, the assemblymen likely to be made exco members from PKR are Mohd Azmin Ali (Bukit Antarabangsa), Dr Xavier Jayakumar (Sri Andalas) and Lee Kim Sin (Kajang). Dr Mohd Nasir Hashim, the protem chairman of Parti Sosialis Malaysia who won at Kota Damansara on a PKR ticket, is also likely to be made an exco member. “We have to show what power-sharing is all about and the exco line-up, apart from ensuring that the various parties are represented, must also ensure we appoint the best people for the various portfolios,” said the Selangor PKR leader when contacted. It is learnt that DAP strongman and former Opposition leader Teng Chang Khim (Sungai Pinang) would likely be left out of the exco line-up as certain quarters feel he may not be an effective team player. State DAP chairman Ean Yong Hian Woh said apart from seeking four state exco positions, the party would also seek to have one of its exco members appointed Deputy Mentri Besar. “It is a fair request given the fact that DAP won 13 seats,” said Yong, the assemblyman for Seri Kembangan, who is also tipped to be made an exco member. Other assemblymen from DAP strongly tipped to become exco members are Ronnie Liu (Pandamaran), Teresa Kok (Kinrara) and Lau Weng San (Kampung Tunku). According to a state PAS leader, the frontrunners from the party for the two exco posts are Datuk Dr Mohd Hasan Ali (Gombak Setia) and Dr Shafie Abu Bakar (Kajang). Other contenders from PAS for the exco posts include Saari Sungib (Hulu Klang), Iskandar Abdul Samad (Chempaka) and Dr Halimah Ali (Selat Klang). PETALING JAYA: Mentri Besar-designate Tan Sri Abdul Khalid Ibrahim wants to make Selangor free of the Official Secrets Act (OSA). He said he had prepared a draft and would discuss the matter with a legal adviser to see if Selangor could be exempted from enforcing the Act so that people have the right to information on state management matters. “Then, the people will know the efforts of the state administration, and we can have check and balance,” Khalid told a press conference yesterday. He refused to comment on speculation that two deputy mentris besar would be appointed – one each for the Chinese and Indian communities. “I have to check on the provisions of the state government over the matter,” he said. Khalid said the state government should be more people-oriented in the distribution of resources rather than base it on political allocation. He also hoped to implement an open tender system for all government projects. Khalid, the former CEO of Guthrie Bhd, said he needed 100 days to familiarise himself with the affairs of the state. On whether PKR would continue to maintain Selangor’s developed status, he said, he would maintain the state's growth rate and would only consider it developed if all the rakyat enjoy good development. Asked if he would abolish the New Economic Policy, Khalid said the policy was not in the Constitution and was merely an administrative document. However, the policy needed to be adjusted to accommodate certain communities, he said. How to address toll rate? The Star has a write-up on our proposal to review toll rate, particulary LDP. Below is the report but I have further explained that the party had one suggested to the government of buying over these highways from private companies since the compensation paid is already higher than the contruction cost of the highway. With that, the government can either provide toll-free highway or reduced-toll highway to motorists. ONE of PJ DAP's pledges in its five-point manifesto is to enhance quality of life by decreasing the cost of goods and renegotiation of unfair contracts, including toll rates. The manifesto was launched last month at the DAP centre in Damansara Utama by the members of what has now become the new government in PJ. The team, comprising new PJ Utara MP Tony Pua, Damansara Utama assemblyman Dr Cheah Wing Yin, Kg Tunku assemblyman Lau Weng San and Bukit Gasing assemblyman Edward Lee, outlined the Damansara-Puchong Highway (LDP) as an exam-ple. “The cost of building the highway was only RM1.3billion, but the profit over 30 years would amount to RM18.7billion. That works up to a return rate of 47%,” Pua had said during the press conference then. Some two years ago, when the government decided to hike up toll rates, the DAP had put forward a suggestion that the government buy back highways specifically in the Klang Valley at cost price in order to reduce the burden on motorists. The high rates of tolls, specifically on the LDP, have been the grouse of PJ-ites since toll rates were hiked, particularly in the light of the traffic congestion that still continues to occur on the highway despite the price increase. The PJ DAP plans to keep its promise, but presumably, residents cannot expect an overnight change. “We will certainly look into it from a larger perspective particularly from the legal and technical aspect of it,” said Lau during a phone interview yesterday. “There are certain terms in the agreement that the government of the day has to adhere to. “We have to see if there are hidden costs involved in the terms and agreements of the highways involved before we can make the appropriate move,” said Lau. During election campaign, candidates are allowed to put up buntings, banners, posters or even billboard to campaign. There are certain rules and regulations to govern how these campaign materials be displaced in public spaces. Candidates are not allowed to put up streamers across the streets, covering others' streamers and posters. Attached are some photos of how BN campaigners cover my posters in Kampung Tunku state seats. Raja Petra Kamaruddin urges Chinese voters to vote for changes in his speech at SS2 Petaling Jaya on 3rd March 2008. 7:00 am [KT] Walkabout at SS3 tai-chi group. 9:30 am [KT] SS3 house to house walkabout. 12:00 noon [KT] SS3 lunch ceramah. 8:00 pm [KT] Ceramah SS1/22, HT Car Accessories. 11:00 pm [KKB] Ceramah Kampung Air Panas. 7:00 am [KT] Walkabout at Taman Aman. 11:00 am Leafleting at SS3 mosque. 7:30 am [KT] Sea Park market walkabout. 9:30 am [KT] Sea Park house to house walkabout surrounding Paramount LRT. 12:00 noon [KT] Walkabout Paramount / Sea Park shops. 8:00 pm [DU] Ceramah at Damansara Utama Kiong Heng. 8:00 am [KT] Walkabout Sungai Way N/V with folks. 10:00 am [KT] Press Conference at Sungai Way market level 3. 7:00 am [KT] Leafletting at Taman Paramount LRT Station. 5:00 pm [KT] Leafletting at Taman Paramount LRT Station. 8:00 pm [DU] Ceramah at SS2 MJ Café. 7:00 pm Taman Mayang political talk dinner.